Motorcycles and mopeds are one of the smallest vehicles on the road. Therefore, you are more likely to be injured or killed if you are involved in a collision. It is imperative that you learn to drive using the necessary safety precautions for your vehicle. The Ontario Ministry of Transportation encourages new motorcycle and moped drivers, and those who wish to improve their skills, to take a motorcycle-safety training course. For more information on motorcycle-safety training courses, please visit the Ontario Ministry of Transportation Website. A helmet is the most important motorcycle or moped accessory you can have. Wearing a helmet can protect you from serious head injury. Ontario’s motorcycle helmet laws require all divers/passengers on a motorcycle to wear crash helmets that are securely fastened under the chin at all times. It is important that the helmet fits snugly and does not slide around. Ensure that it is well constructed and in good condition. In Ontario, helmets may be equipped with speaker/ear phones for the purposes of communication only. They cannot play music. Keep in mind that the same rules for “distracted driving” applies to motorcycle drivers and therefore, any wireless communication device may only be used to make, answer or end a call or to transmit or receive voice communication on a two-way radio or handheld microphone or portable radio. Motorcycle helmets must meet the safety standard approved for use in Canada. These helmets include CSA, D23, DOT 218, BSI Helmet Standard or Snell Foundation. The highest point of the handlebars, not just the grip portion, cannot be higher than 380mm or 15 inches above the horn of the seat (the portion between the driver’s legs) when the seat is compressed. 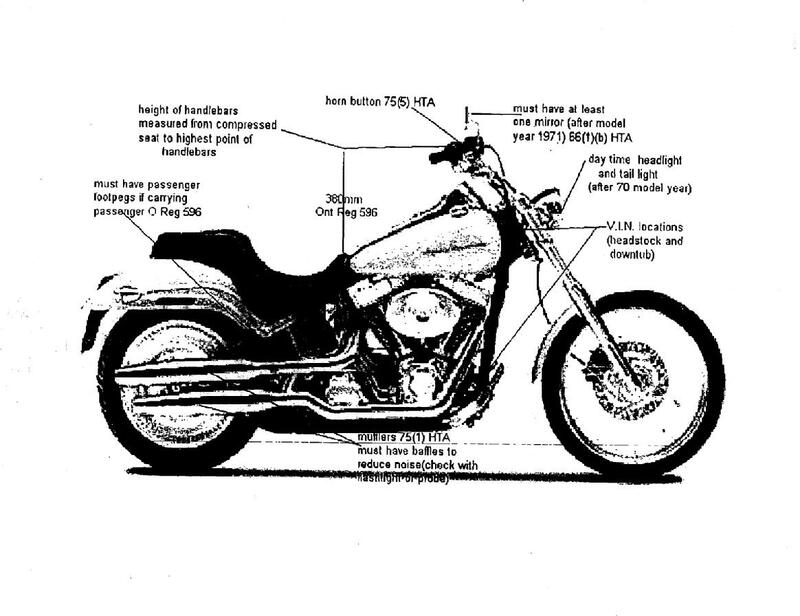 Handlebars cannot be loose or damaged in such a way as to interfere with the safe operation of the motorcycle. Retain enough heat to burn off engine gasses. If the exhaust does not have ALL 3 of these functions, it is illegal. Many motorcycle companies sell “aftermarket” pipes which are custom design. The problem with some of these products is that they often have flow restrictors only…which makes them illegal. If you purchase any aftermarket product for your motorcycle, you need to ensure that it has passed all the standard emissions and noise testing set forth by the Province.